The Mecklenburg County Aquatic Center is a world-class natatorium featuring a 50-meter competition pool, a 25-yard therapeutic pool, and a spa. Originally constructed in 1991, with Counsilman-Hunsaker as the lead aquatic designer, the aquatic center needed major renovations and repairs. To address these issues, Counsilman-Hunsaker performed an audit to evaluate the life expectancy of the facility, while at the same time identified ways to enhance and complement existing programming. Moreover, the study developed project costs to repair and renovate the facility as well as additional enhancements. Innovative renovation included the reuse of the filtration system, adaptation and reuse of below grade pool piping, and installation of systems to improve both pool water and air quality. 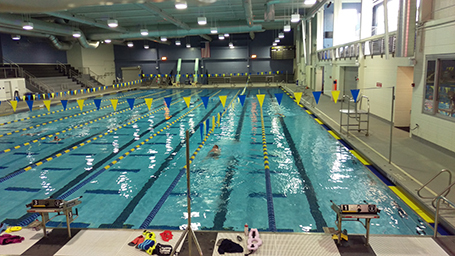 The facility includes an updated, efficient entry and expanded natural daylighting into the natatorium. Since its commissioning, the aquatic center has hosted various national competitions including the Arena Pro Swim Series. The facility also offers programs and events for all ages and ability levels, one-on-one specialized instruction, lap swimming and recreational swimming.